The change in the multi-GPU game over the last eighteen months or so has been dramatic. It's been a long time coming but the technology is finally coming of age, but there's now a real reason to be dropping a second card into your home system other than just bragging rights: straight performance. When the technology first became available in our home gaming rigs though it was very different situation. With a combination of flaky driver support, dodgy hardware implementation and frankly shoddy performance, it was hard to recommend anyone part with the extra cash for the second card. The diminishing returns you got from dropping in that second GPU made it a very expensive and ineffectual luxury. With driver improvements, and far better graphical silicon coming from both the giants of the graphics card world, the performance boost from dropping in the extra card has improved measurably. We're finally getting close, and sometimes hitting, that two times boost the extra silicon and spending money ought to give you. There is now a compelling argument for at least making your initial graphics card purchase with a thought to adding a duplicate GPU at a later date. Or just making a twin purchase right off the bat. With the performance of lower-end cards in multi-GPU setups rivalling, and sometimes beating, the top cards of their generation it's quite a feat. Especially considering that picking up two lesser cards is often a cheaper way to go too. The question is though, in which basket do you place your eggs? With single graphics cards the motherboard isn't an issue, but when you're talking about pairing them up it's an exclusive club. You can drop any single card into a board but double-up and you need to make a choice. Do you hedge your bets and pick up a standard, CrossFire-ready mobo, or spend the extra cash and look out for an SLI-certified board? Well, that's what we're here to help you decide. 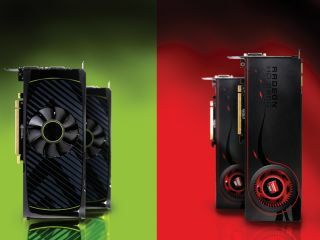 We've paired up the top two mid-range offerings from Nvidia and AMD, the GeForce GTX 560 Ti and the Radeon HD 6950 to see how the manufacturer's multi-GPU tech and their individual silicon performs. The SLI vs CrossFire debate has been raging for around six years now, but a quick look at the Steam hardware survey would tell you that Nvidia has won. Of the small percentage of multi-GPU gamers on Valve's network a massive 95 per cent are running SLI. That's interesting considering SLI-certified motherboards are a relative rarity compared with their ubiquitous CrossFire-capable cousins. Nvidia has stopped creating its own chipsets that means it's just a question of licensing for the motherboard manufacturers. But what this also means is a price premium for that SLI certification; so more often than not it's only the high-end motherboards offering SLI options. So if you want to have an SLI setup you really need to be thinking about that when you come to build the basics of your gaming rig in the first place. CrossFire is a lot more forgiving, but then being so far behind it really needs to be. Chances are that if you've got a relatively modern ATX board in your current rig you're already set up for an AMD-based solution. But since their inception both technologies have been little more than a luxury, and mostly found in high-end rigs from system integrators. That began to change though when AMD changed its GPU strategy. With the ill-fated HD 3000 series it decided it could no longer compete at the high-end with its Nvidia rivals, deciding instead to opt for cheaper, volume GPUs. Its solution for the high-end though was to pair up two of its cheaper GPUs on a single PCB. Now, it wasn't a great strategy right away. The shoddy and short-lived GeForce 7950 GX2 showed how messed up twin GPUs could be and the HD 3870 x2 was little different. The subsequent generations of AMD's multi-GPU single cards; the HD 4870 x2 and HD 5970, forced it to tighten up its CrossFire drivers to great success. This multi-GPU competition also forced Nvidia to redress the diminishing returns of its own driver set to the point where we're now sometimes seeing double the performance from twin card setups from both companies. It's also set to be the high-end battleground of this current generation of cards, with Nvidia's GeForce GTX 590 and AMD's Radeon HD 6990 stepping into the ring in the next couple of months for a real battle royale. With cheese. But at this crazy high-end of graphics cards you're looking at £500+. Pick up a couple of £200ish mid-range cards though and you'll get almost the same level of performance. The GeForce GTX 560 Ti is Nvidia's latest mid-ranger and is the natural evolution from the frankly awesome GTX 460. Paired up this older card produces the same sort of performance as a GTX 580. With this new GPU pairing though you're passing the GTX 580's performance in all our tests bar the system-crushing Metro 2033 and Crysis Warhead benchmarks. Our favourite card of the moment, the Radeon HD 6950, however, has a clean sweep in CrossFire compared to the single GeForce flagship card. The tessellation-heavy benchmarks of Heaven 2.0 and Metro 2033 are the most telling, offering numbers at the 2,560 x 1,600 resolution that we've never before seen. In some of the legacy benches though, particularly the Nvidia favouring DiRT 2, the twin GTX 560 Ti holds sway. But overall the somewhat pricier AMD twin-set wins out. As well as the performance benefits, including a 100 per cent boost in Heaven 2.0, the HD 6950 setup is also one that more people will have access to. SLI-certified boards are still fairly rare, high-end products, whereas most ATX boards will already have CrossFire capability as standard. With this latest card and a more solid driver set AMD could well be cutting that 95 per cent Nvidia Steam favouritism down to size. CrossFire for the win, then. Who thought you'd hear anyone say that a year or so ago?